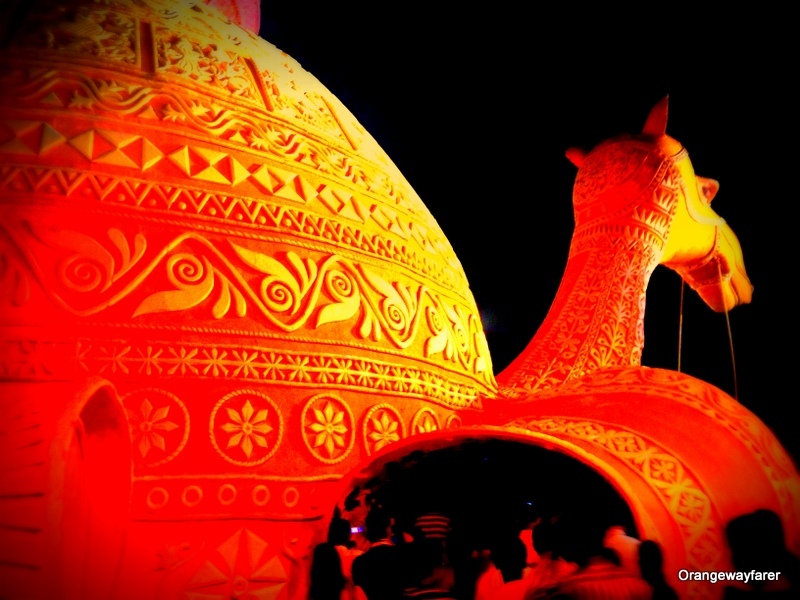 If I have to tell you to come visit Kolkata, I need to tell you all about Durgapuja. All of it. 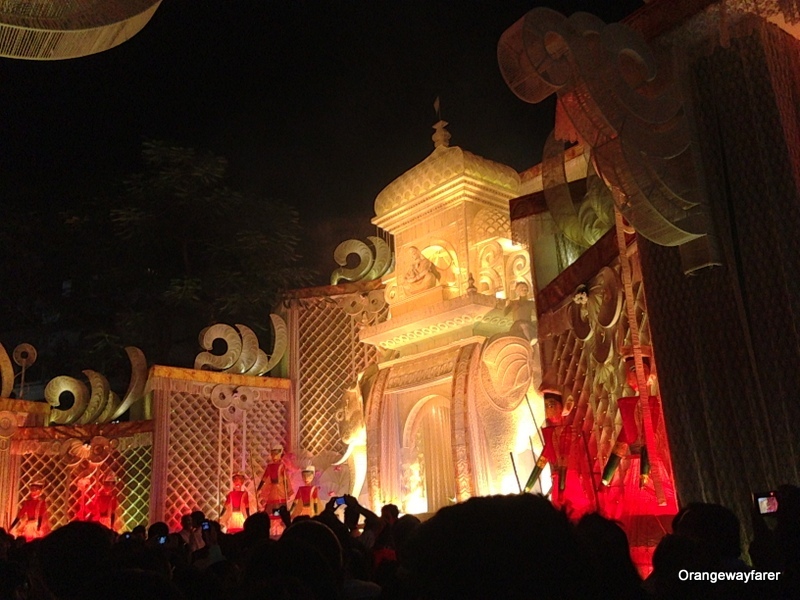 The annual homecoming session is Durgapuja for the whole of Bengal. 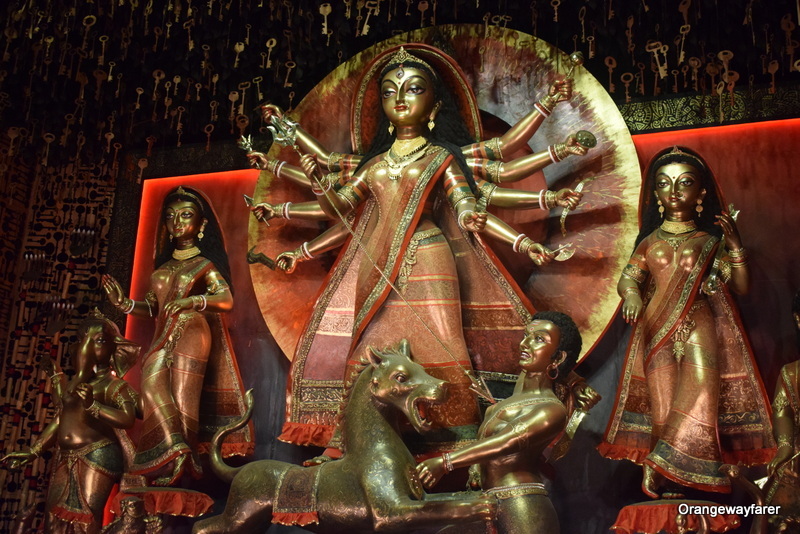 Hindu Bengalis believe the Goddess Durga takes a break from her household in Kailas and comes to her maternal home with four children. To commemorate the homecoming, the households and lately the Baroyari (Baaro, 12+ Yaari, friends, meaning a committee) clubs have introduced a week long festivity that easily transcends petty religious differences and hardly truncates celebration to any ritualistic norms. 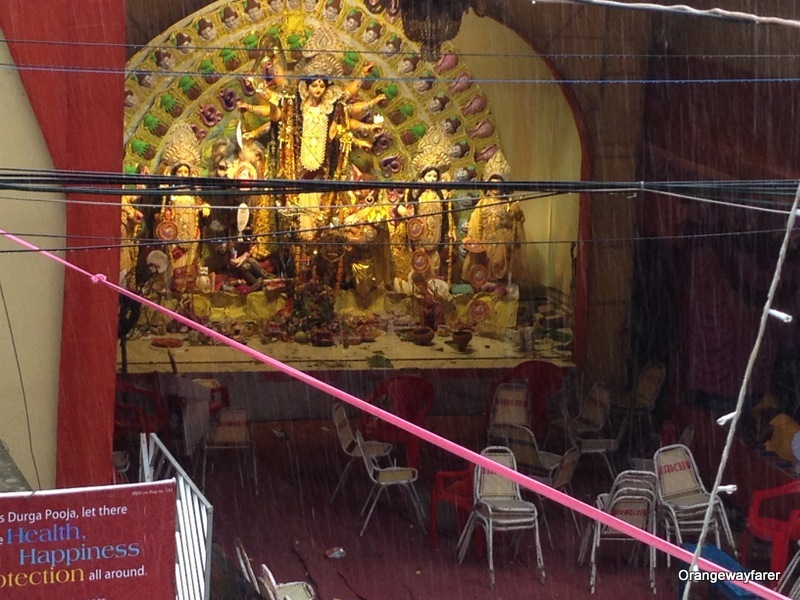 Kolkata, the city otherwise left in disdain, shows a prowess of celebration unheard of. 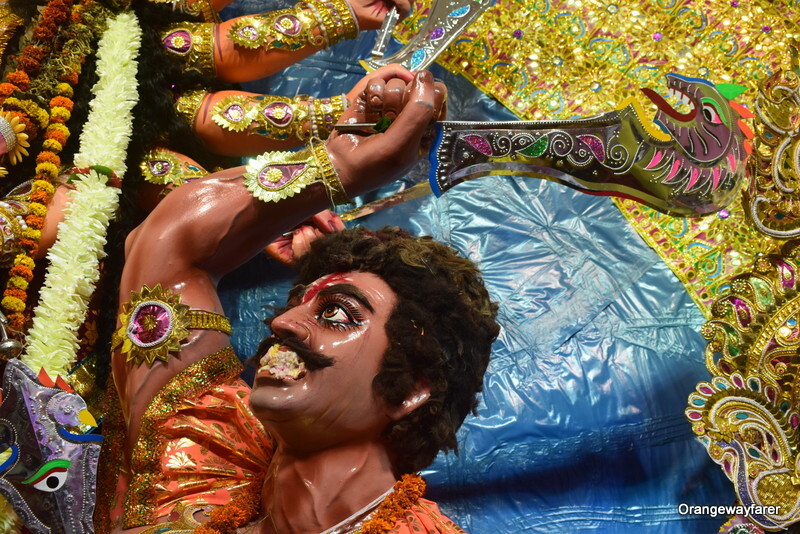 Kolkata Durgapuja can make or break your impression of the city, unless you have got the following disclaimers! 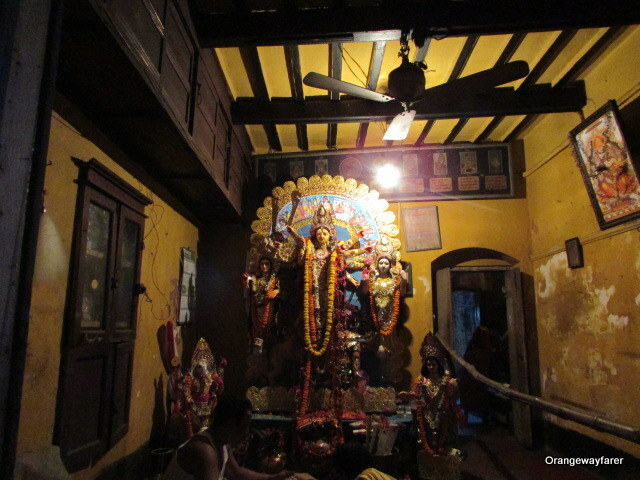 A Bonedi Bari Puja, at Ballygange, my friend Raktima’s home. The deity is treated as a “Ghorer meye” in true sense! On the left most, stands tall a banana tree, referred to as Kolabou, Ganesh’s wife! 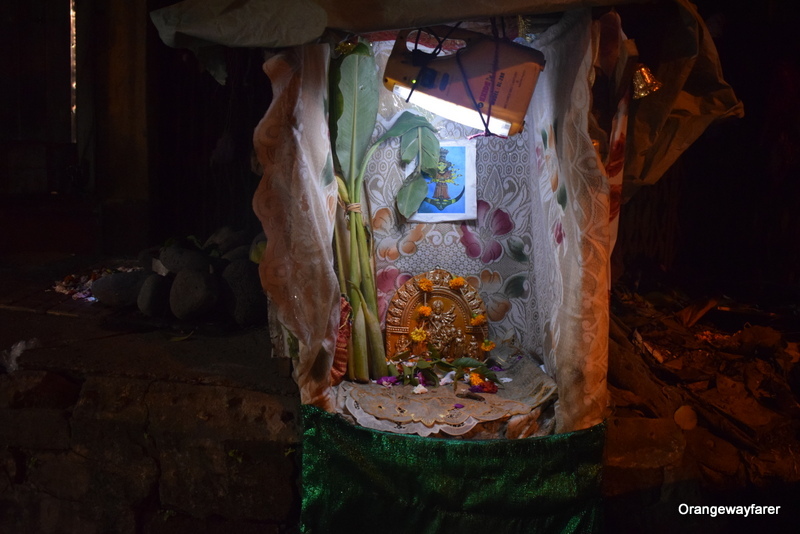 A random find, a Puja by the Jatin Dash metro I found in 2016. I went to the area this year as well but did not find her again. 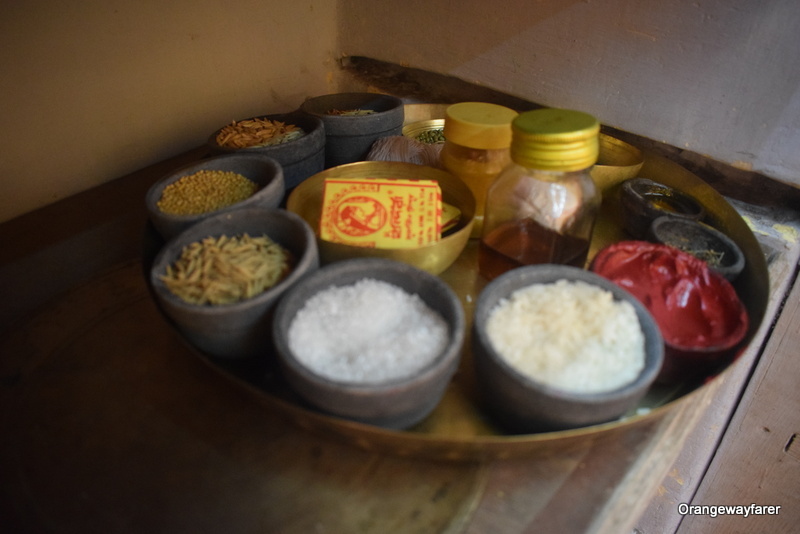 This Puja appealed to me majorly for the “Koriborga” Ceiling of the house and menial arrangement aptly magnifies the love! The offerings…. contains honey, aniseed, vermilion, Ghee and many more fine condiments. Every year, I return, I lament. I lament all the more as the holidays come to an end and I see pandals being demolished. 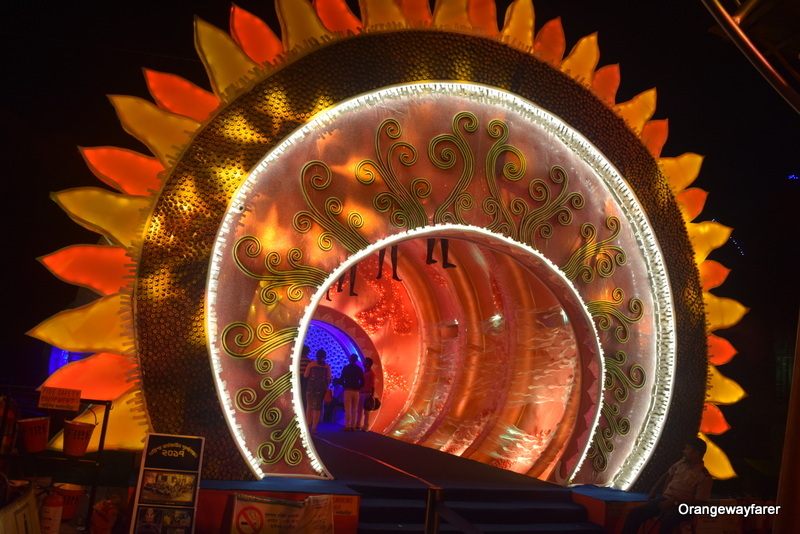 The pandals are few of the spectacular example art work, indeed. The godforsaken water molecules, omnipresent in the air, and over joy of them is deemed fit to torment your soul. No kidding. Often one sleeps at night to wake up all drenched in sweat the next morning. 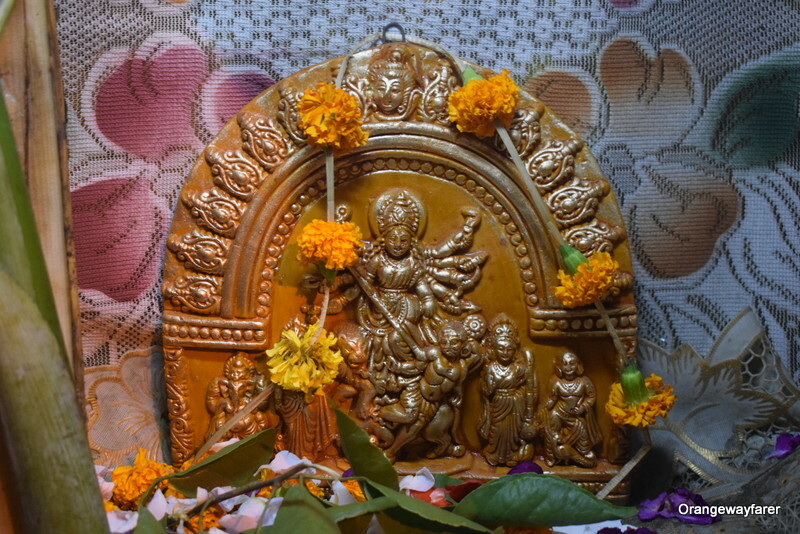 Durgapuja takes place as the Panjika suggests, in and around October. 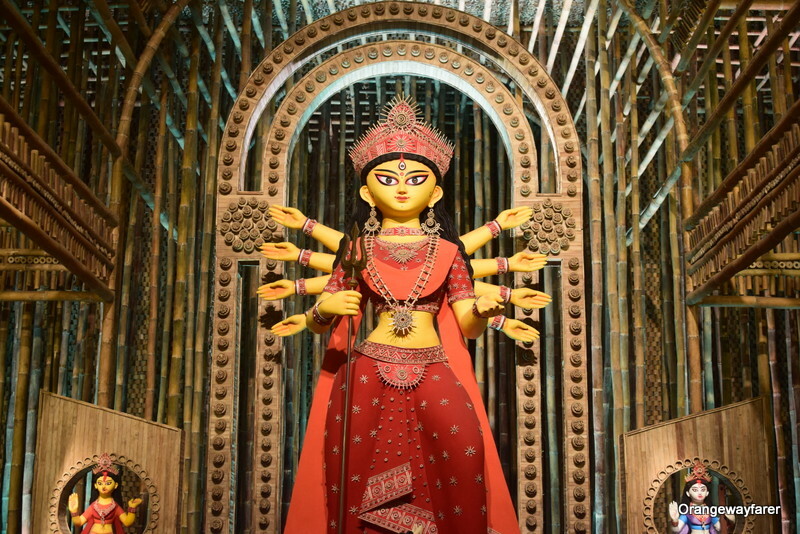 A Puja, scheduled during the end of October shall give you some respite but the earlier dates shall be grueling. Beware. Also, as the Puja ends, the temperature teases you with “Heem“. 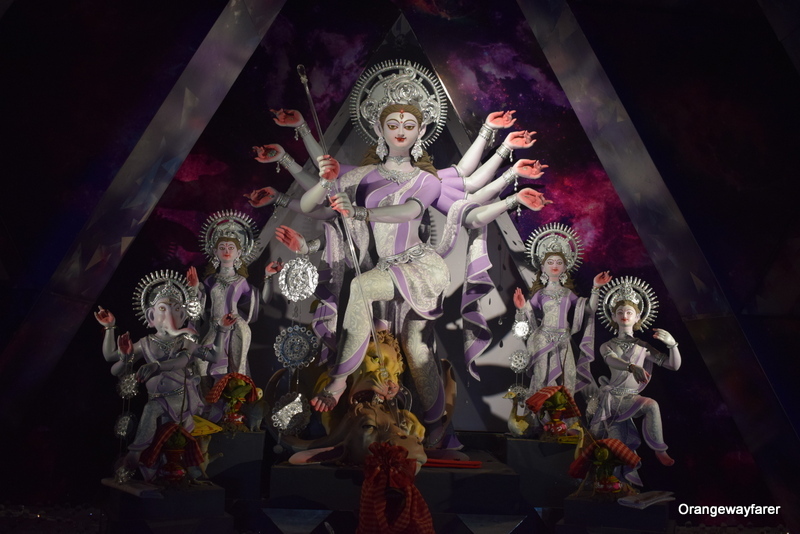 The Ripley’s believe it or not shall fail if i had to describe the mass footfall Kolkata receives for the week during Durgapuja. Millions of people… an ocean of people… swarming mass of human if you can witness it from space…. A densely populated city that Kolkata is, she also receives eager populace from suburbs and other districts. 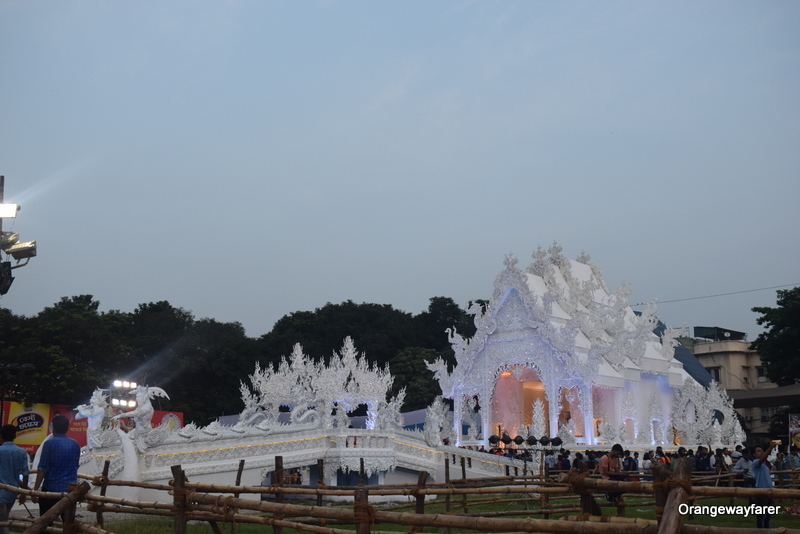 Of course, Kolkata Puja pandals are phenomenal. 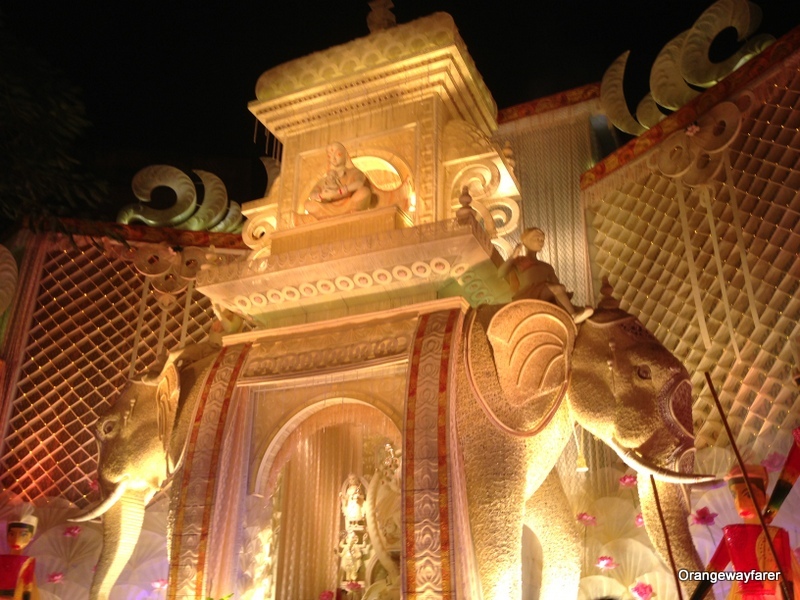 Bucket lists often features a list of pandals one shall visit for each day of the Puja. The crowd and I walked to reach here amid this crowd for about 3 KM. No kidding! Trust me when I say this, I grew up savoring Kolkata Biryani and chow-min! Nothing saddens me more than witnessing the greasy and tasteless food on sale, even at the reputed foot chains, leave alone the stalls. I tried Blossoms at Hedua, Golbaris, Hatari and few biryani giants (Aminia etc). Hugely disappointed. The only saving grace was Mocambo and Peter Cat at Part Street and the Cafe by the Jatin Dash Park metro station. 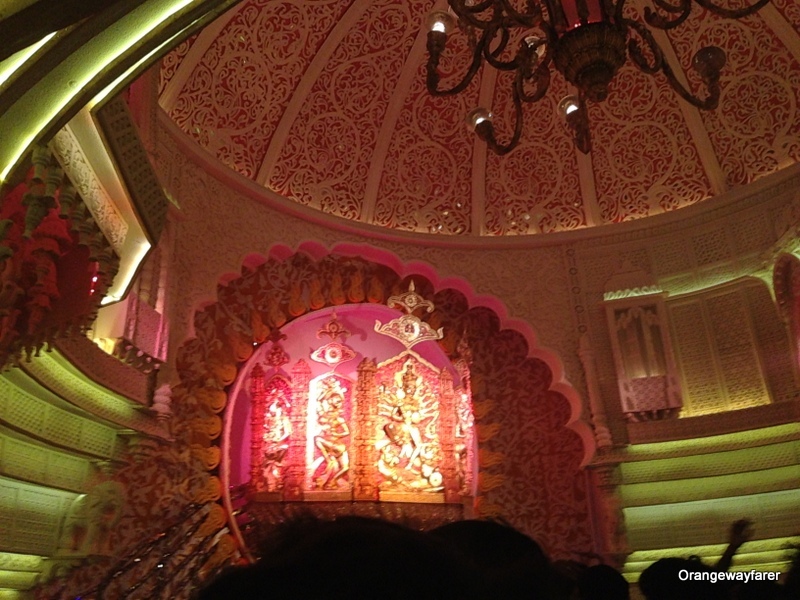 A blog post awaits that details the joy of dining in Kolkata. 4. Sustainable, what is that? 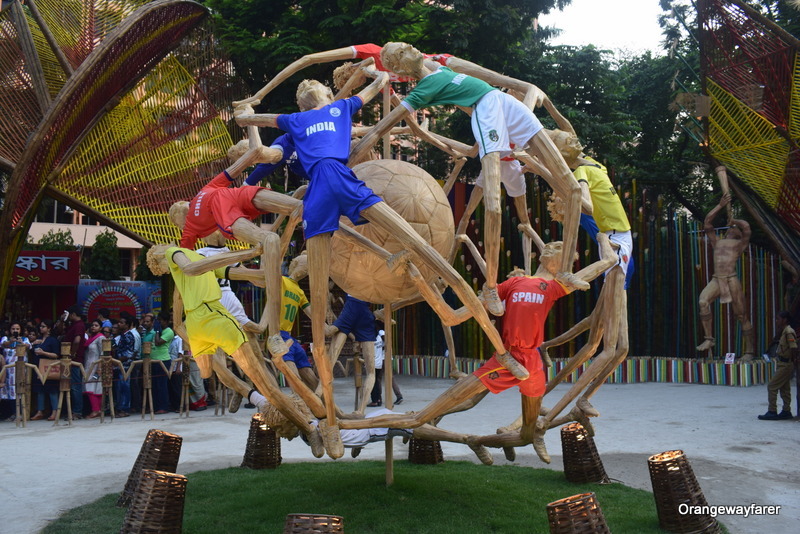 The pandals often send out the message of recycling and use daily products to decorate as a way to show it. 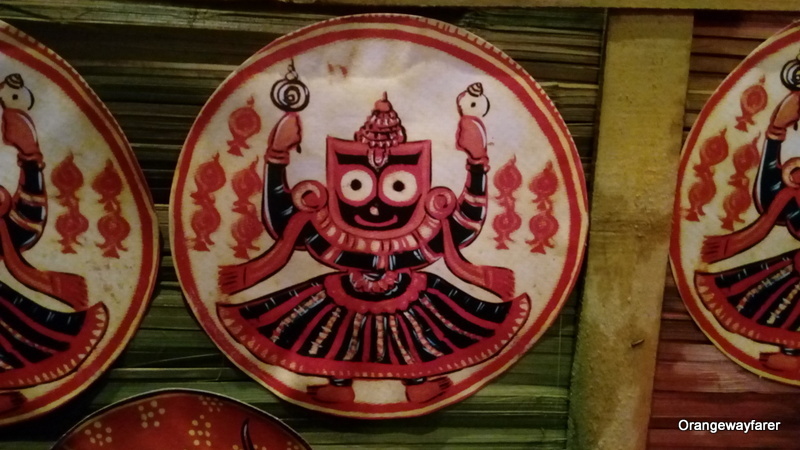 However, come to think of the plastic containers for food, water, cold drinks, ice cream wrapper, make shift food stalls, and finally the idols getting immersed in the Ganges water or local ponds with all the decoration, colours etc, it is horrid! A huge shout out to the traffic police controller of Kolkata for conducting traffic unhindered during the 5 days of durgapuja, 2017. However public transport is scarce and slow moving while Uber shall surge price the bomb out of you. Try arrange for a personal car or at least a bike if you want to save time. 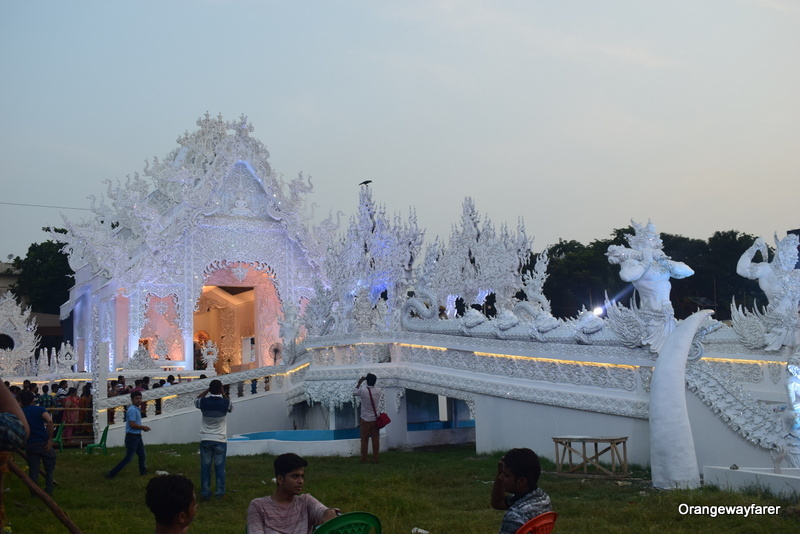 Alternatively, you may also want to walk for hours and start pandal hopping at the wee hours of morning. But come what may, the mammoth traffic shall not move an inch on whim if you expect to commute fast in the evening. Everything is overpriced. Period. If you are traveling to Kolkata and plan to purchase souvenirs, wait till Dashami (the last day of Puja). If you want to buy the ear rings from street vendor, perfect the art of bargain. 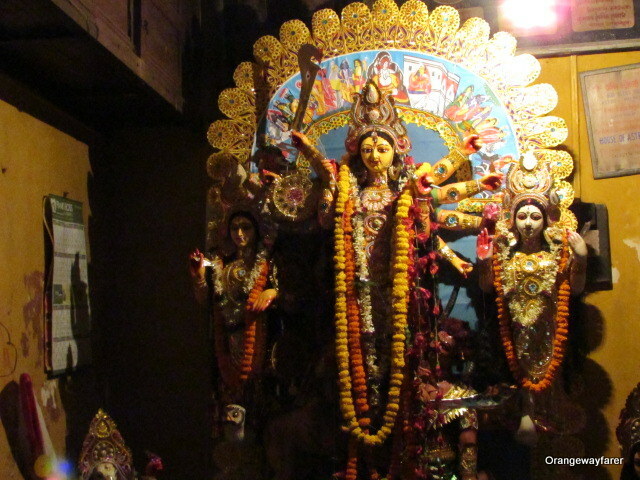 It was a ritual for us to travel to Bankura during Puja, for long. Later, as we grew up, we used to quickly escape to the beaches nearby. I have eavesdropped with or without intent multiple conversation at Pandals, restaurants, airport, metro station where people discuss flight tickets to Thailand or Vietnam. Two of the popular destinations with close proximity to the east Indian city. Several of my friends fly to Sikkim and explore the marvelous Himalayas. While I am all happy for them, I pine for as extended holiday with the Puja blues dying hard. I hope I am not the only envious person living on this Earth (Angelic smile)! Have you been to Chiang Mai, Thailand? Worry not for Kolkata has the Pagoda in place for you! 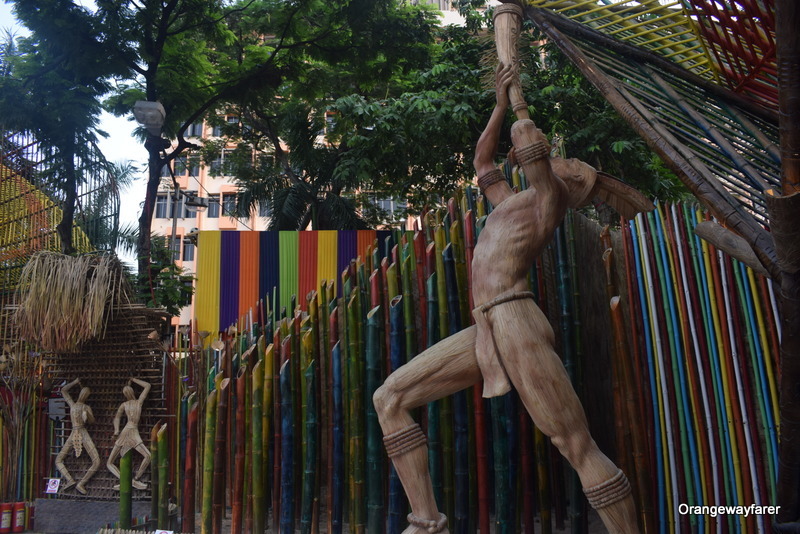 A piece of Thailand in Kolkata. This is happiness. My childhood Durgapujas were all about securing a window seat in Purulia Express and heading for Bankura, my native with the family. The cousins shall be home. We will have 5 ays of no studies, no math lesson, storybook reading for as long as we want and new dresses to wear with specific ear rings. 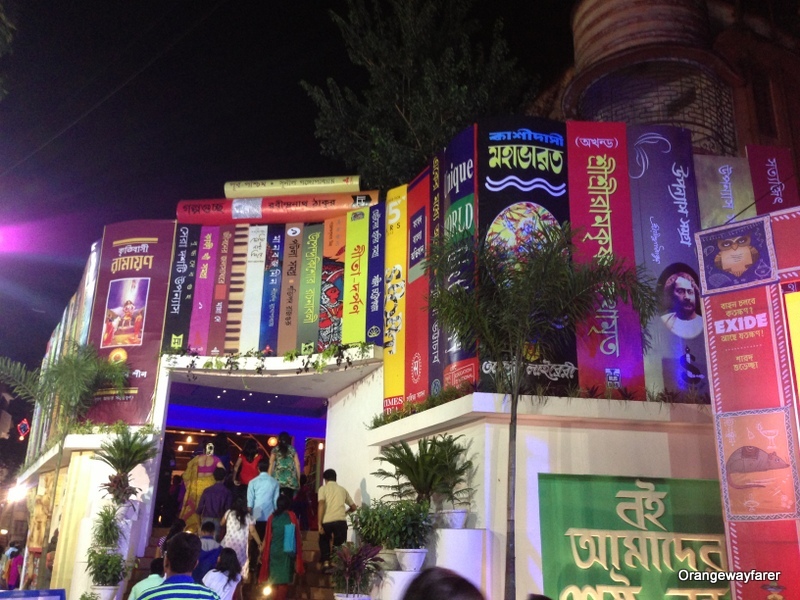 This was heaven for long till we came to know about the Kolkata Puja and night outs! Night outs for Puja eventually turned out to be a Maddox square Adda, a long drive to Kolaghat and lately Park Street(for the restaurants there serve good food, unlike rest of Kolkata and lesser crowd). Life happens. The green fields and Kash flower quickly transcend to movie shows at the malls. Old memory lives on sans those unique fragrances. 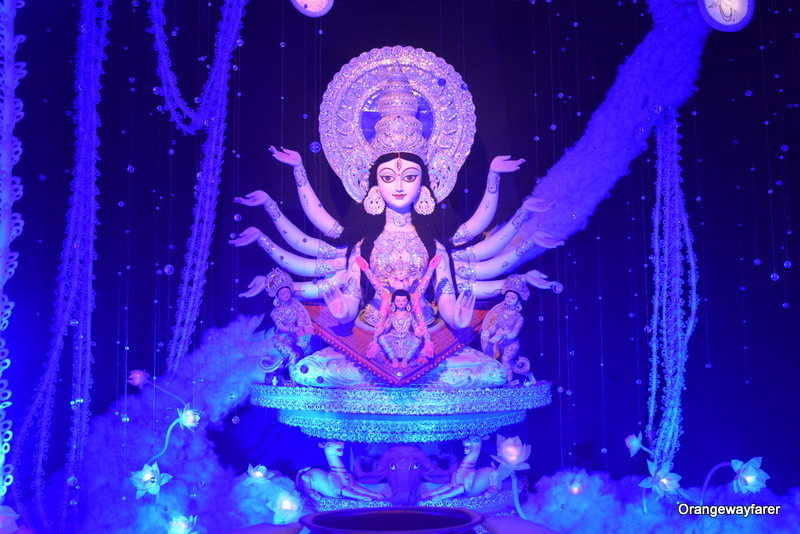 As an agnostic, there are millions of arguments I have heard against Durgapuja. Of how the worship is casteist and represent the societal bigotry. Of how the widow and unmarried women are yet to be welcome in celebration unequivocally. 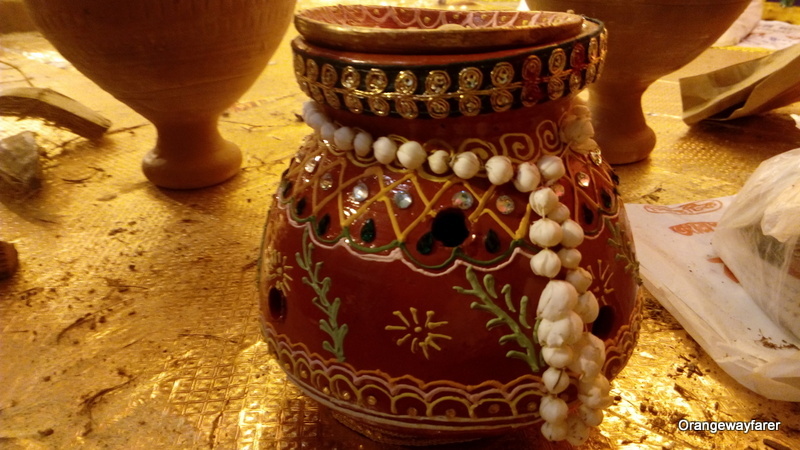 The Kumari Puja and the reason behind (only girls pre puberty qualify for the ritual, for only they are “Pure”) has put me off from attending one, ever. The fact Ashura represents the king of the tribesmen from a sprawling part of the nation is omnipresent. I have marveled at the glorious statue at Chamunda hills, Mysore while the Kolkata Mahishashurs, often formed after political opponents or a skilled cricket player from a different country, are mostly ignored. A shameless show of money was when the deity was adorned with a billion worth gold Saree. All this, said and done, my heart melts when Maa shall “baran” her with beetel leaves and sweetmeat. Even the lion will have his share of sweets. 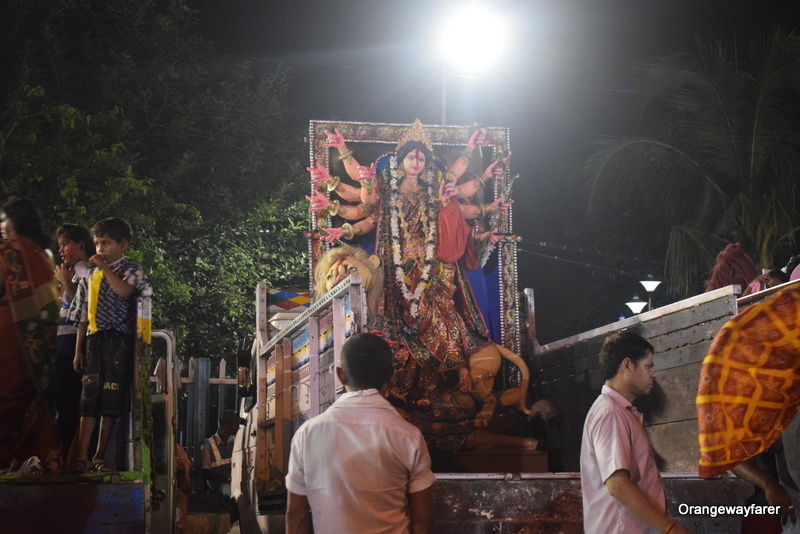 The truckloads heading towards Ganges to immerse the idol, even the finest of them. 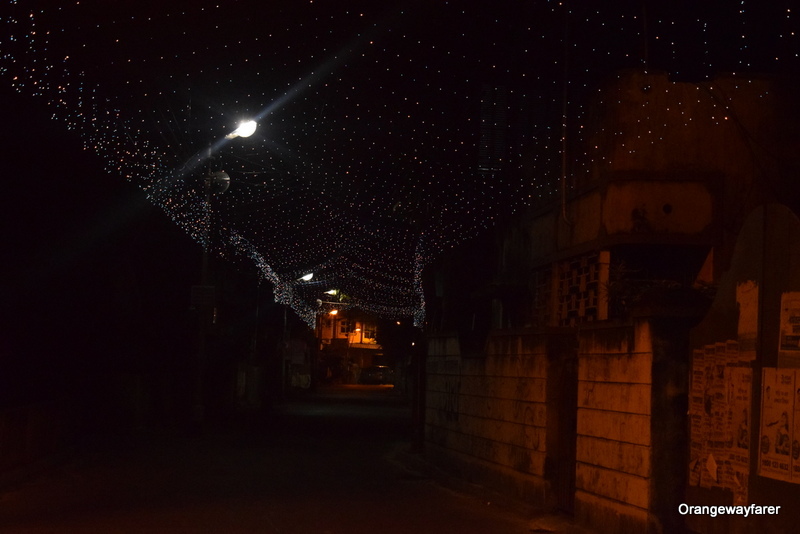 The pandals are empty, streets are stripped off the Tuni bulbs, auto fares normalizes, the women of Kolkata refrain from wearing the finest of Sarees. The most beautiful Goddess I have seen. Enjoyed reading this post a lot. Very nicely covered different dimensions. Thank you. I felt I need to be honest with the readers. 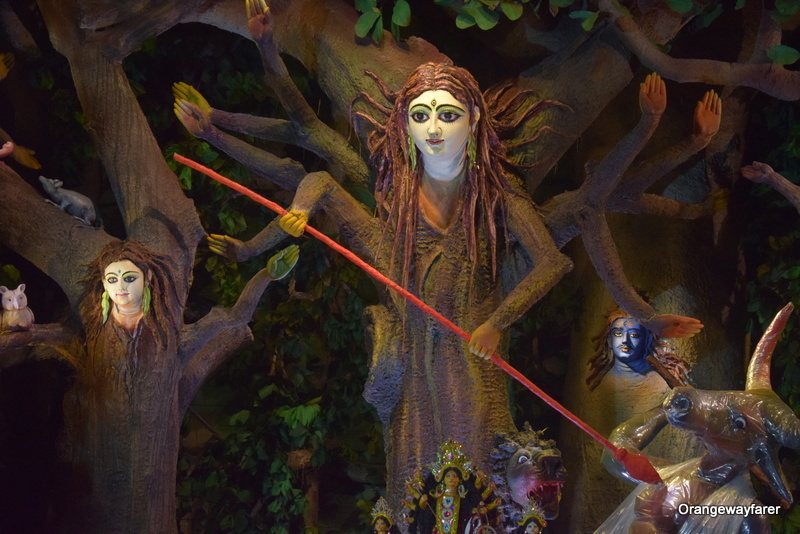 Well written, good and (not so good) stuff about Durga Pooja in Kolkatta. Keep writing more. A very informative well written piece. The photographs are lovely. Thank you so much. 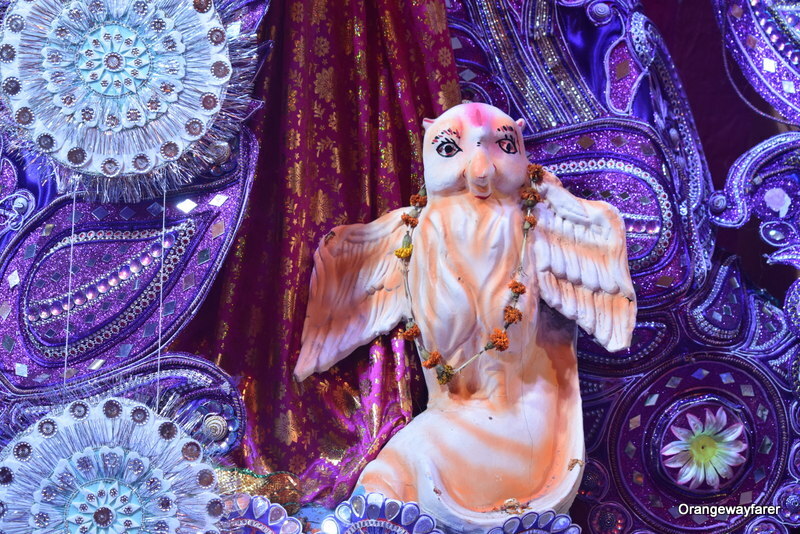 The idols are so beautiful, photos are bound to come vibrant!